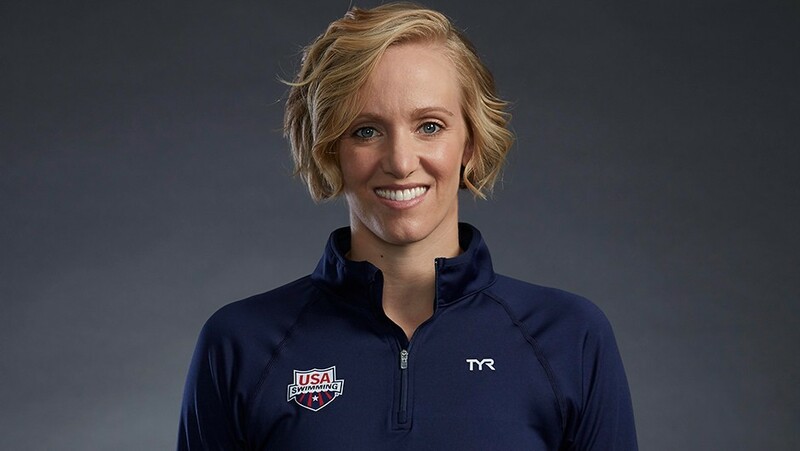 Five-time Olympic gold medalist Dana Vollmer will be at Big Swim Big Kick on April 28. Kids will have the opportunity to meet Dana and take photos. At 12 years old, Dana Vollmer was the youngest swimmer at the 2000 US Olympic Trials. She finished 47th overall, a long way from qualifying, but it was at this event she made going to the Olympics her goal. The fire was lit, and there was no stopping her. Today, Dana is one of the most decorated female Olympians with seven medals (five gold, one silver, and one bronze) over three summer Games (2004, 2012, and 2016). Dana grew up in Granbury, Texas, and was in the pool before she could walk. Her mom was a swim coach, so she was always around water. Though Dana was always attracted to swimming, she played a variety of sports growing up—soccer, track, volleyball, gymnastics, and basketball. She didn’t turn her sole focus to swimming until after eighth grade. Dana’s dream of making the Olympic team came true in 2004. At age 16, everything fell into place at the Athens Games. She came home with a gold medal as part of the world record-setting 4x200-meter freestyle relay team. On top of the world, she was poised to make another run in 2008. But having reached the pinnacle of the sport and accomplishing all of her goals, she felt unsure of what to do next. Ultimately, she failed to make the team in 2008. Watching the 2008 Beijing Games from home, Dana realized she needed to change her approach to the sport if she wanted to return the top of the swimming world. “In the grand scheme of things, it was the best place for me to be because I was at my lowest and could make drastic changes,” she says. So for the next four years, Dana worked on her mental approach. She focused on smaller goals instead of the big picture. She went to Fiji with a program that teaches swimming skills for survival. She practiced staying calm under pressure. She treated every race, no matter how big or small, like she was competing at the Olympics. A different approach proved to be exactly what she needed. She came back swimming faster than ever. Not only did she make the team, Dana won three gold medals at the 2012 Games while setting two world records. Her world record in the individual 100-meter butterfly of 55.98 seconds was the first time a woman swam the event under 56 seconds. Dana decided to step away from the sport and see what life was like without it. She focused on her family and had her first son, Arlen, in March 2015. Entering a new stage of life and coming off of seven weeks of bedrest during pregnancy, she was itching to get back in shape. This time, her training looked different than most top athletes. She had to strike a balance between being a mom and a competitor. Swimming from a healthy place and despite others telling her she needed to put in more hours in the pool, Dana earned her third Olympic berth at the Rio Games in 2016. She won three medals (one gold, one silver, and one bronze), becoming the first American mother to win a swimming gold medal. Swimming has helped Dana keep life in perspective. In July 2017, she welcomed her second son, Ryker. She credits the sport with shaping her into a confident, well-rounded person. Dana is still training, getting faster, and breaking stereotypes of what it looks like to be a mom. She knows her swimming career will come to an end one day, and having a family has made her realize that she is going to be OK. She eventually wants to pursue a career in architecture and inspire the next generation of swimmers at events like Big Swim Big Kick.